It is 29–30 cm in length and weights 140–180 g. A large dove, larger and heftier than a Mourning Dove but smaller than a Rock Pigeon. Found in urban and suburban settings with access to bird feeders. As well as farm that has grain silos. 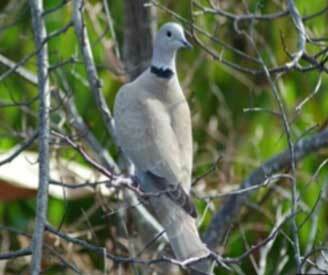 Introduced to North America from the Bahamas, where several birds escaped from a pet shop during a mid-1970s burglary; the shop owner then released the rest of the flock of approximately 50 doves. Spread through reproduction during the warm months but can nest year around if temperatures are warm enough. Tend to chase off other birds, including Mourning Doves, cardinals, and Blue Jays. Also carry the disease-causing parasite, Trichomonas gallinae, which they may spread to native doves at feeders or birdbaths, or to the native hawks that feed on them.